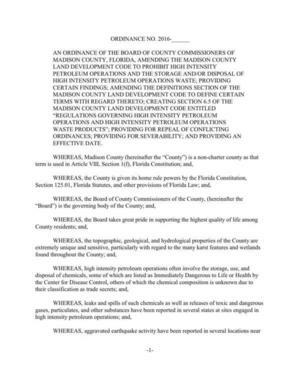 AN ORDINANCE OF THE BOARD OF COUNTY COMMISSIONERS OF MADISON COUNTY, FLORIDA, AMENDING THE MADISON COUNTY LAND DEVELOPMENT CODE TO PROHIBIT HIGH INTENSITY PETROLEUM OPERATIONS AND THE STORAGE AND/OR DISPOSAL OF HIGH INTENSITY PETROLEUM OPERATIONS WASTE; PROVIDING CERTAIN FINDINGS; AMENDING THE DEFINITIONS SECTION OF THE MADISON COUNTY LAND DEVELOPMENT CODE TO DEFINE CERTAIN TERMS WITH REGARD THERETO; CREATING SECTION 6.5 OF THE MADISON COUNTY LAND DEVELOPMENT CODE ENTITLED “REGULATIONS GOVERNING HIGH INTENSITY PETROLEUM OPERATIONS AND HIGH INTENSITY PETROLEUM OPERATIONS WASTE PRODUCTS”; PROVIDING FOR REPEAL OF CONFLICTING ORDINANCES; PROVIDING FOR SEVERABILITY; AND PROVIDING AN EFFECTIVE DATE. WHEREAS, the Board has complied with all requirements imposed by Florida law for the enactment of this ordinance. The above recitals are hereby incorporated into this ordinance as if restated herein and constitute the legislative findings and intent of the Board. Acid Well Stimulation Treatment means a Well Stimulation Treatment that uses, in whole or in part, the application of one or more acids to the well or underground geologic formation with the intent of enhancing the production of oil or gas from the well. The Acid Well Stimulation Treatment may be at any applied pressure and may be used in combination with Hydraulic Fracturing Treatments or other Well Stimulation Treatments. Acid Well Stimulation Treatments include, but are not limited to, acid matrix stimulation treatments and acid fracturing treatments. High Intensity Petroleum Operation means any or all of the following, as defined in this section: (1) Well Stimulation Treatments and (2) Secondary and Enhanced Recovery Operation. High Intensity Petroleum Operation Waste Product means water, hydraulic fracturing fluid, acid, natural gas, steam, air, carbon dioxide, nitrogen and other chemical substances (including all solutions and mixtures of the same in any concentration) which have been used for a High Intensity Petroleum Operation or some part thereof. Hydraulic Fracturing Treatment means a Well Stimulation Treatment that, in whole or in part, includes the pressurized injection of hydraulic fracturing fluid or fluids into an underground geologic formation in order to fracture or with the intent to fracture the formation, thereby causing or enhancing the production of oil or gas from a well. Secondary and Enhanced Recovery Operation means any operation where the flow of hydrocarbons in an oil or gas well are aided or induced with the use of injected substances including but are not limited to, the introduction or injection of water and natural gas, steam, air, carbon dioxide, nitrogen, chemical substances and any other substance of combination thereof. Examples include waterflood injection, steamflood injection, and cyclic steam injection. Well Stimulation Treatment means any treatment of an oil or gas well designed to enhance hydrocarbon production or recovery by fracturing, heating, dissolving, or otherwise increasing the permeability of the formation. Well Stimulation Treatments include, but are not limited to, Hydraulic Fracturing Treatments and Acid Well Stimulation Treatments. Regulations Governing High Intensity Petroleum Operations and High Intensity Petroleum Operations Waste Products. Notwithstanding anything else in this Land Development Code to the contrary and regardless of whether any special exception, site plan, subdivision plan, or other development approval is requested from the County or any other regulatory agency or body, High Intensity Petroleum Operations shall not be an allowable use in any land use district and shall be otherwise prohibited over, under, on, within, and through all of the land governed by this Land Development Code. This prohibition shall apply regardless of whether the surface access point for any such High Intensity Petroleum Operation is located on land governed by this Land Development Code. B. Notwithstanding anything else in this Land Development Code to the contrary and regardless of whether any special exception, site plan, subdivision plan, or other development approval is requested from the County or any other regulatory agency or body, the storage and/or disposal of High Intensity Petroleum Operation Waste Products shall not be an allowable use in any land use district and shall be otherwise prohibited over, under, on, within, and through all of the land governed by this Land Development Code. This prohibition shall apply regardless of whether the surface access point for any such storage or disposal operations is located on land governed by this Land Development Code. All ordinances or parts of ordinances in conflict herewith are hereby repealed to the extent of such conflict. It is declared to be the intent of the Board that if any section, subsection, sentence, clause, phrase, or portion of this ordinance is for any reason held invalid or unconstitutional by a court of competent jurisdiction, such portion shall be deemed a separate, distinct and independent provision, and such holdings shall not effect the validity of the remaining portions hereof. This ordinance shall become effective as provided by law. ORDAINED upon due motion, second, after discussion, by majority vote this _____ day of _______________, 20__. Thanks to Sherilyn Pickels, Assistant County Coordinator, BOCC Administrative Office, Madison County, for sending the ordinance in response to a phone call. Other counties could learn to be so responsive. The Madison County Land Development Code that this ordinance modifies, and its Comprehensive Plan, are available through its Planning and Zoning web page. And congratulations to Floridians Against Fracking. WWALS is proud to be a member. This entry was posted in Aquifer, Fracking and tagged acidization, Aquifer, CDC, Center for Disease Control, conservation, dangerous, earthquake, emergency response, environment, Florida, Florida Constitution, Floridan Aquifer, fracking, gas, Health, high intensity petroleum operations, home rule, hydraulic fracturing, hydrology, karst, Land Development Code, leak, life, Madison, Madison County, north Florida, oil, quality of life, Rachel Walsh, Rick Davis, river, Safety, Sherilyn Pickels, south Georgia, spill, Tim Sanders, toxic, waste, watershed, welfare, well, wetlands, WWALS, WWALS Watershed Coalition on April 28, 2016 by jsq.